The Denver Broncos defeated the Seattle Seahawks, 27-24, during the NFL’s first full Sunday of action. The brightest spot on the Broncos offense was by far Emmanuel Sanders. Sanders got the Broncos going early with a couple of big catches, the most important one on a 43-yard catch and run that gave the Broncos their first lead of the day. The biggest assist in the passing game for the Broncos came from the offensive line. Case Keenum did not have much pressure on him throughout the game, and it helped him go through his progressions and control the offense. The solid blocking up front was also present in the running game, as the Broncos ran for 146 yards and averaged 4.6 yards a carry. Von Miller got the sacks, but it was almost as impressive what Bradley Chubb was able to get done along the edge. Matched up often with Duane Brown, he got more than his fair share of victories. The scary thing aboutMiller’ss performance is we’ve seen him play better. His clean pass-rush wins were lower than you’d normally see, yet his ability to finish plays looks as good as ever. The once vaunted Legion of Boom has been disassembled, but Seattle got particularly good play from their safeties Earl Thomas and Bradley McDougald. Both safeties combined for three interceptions and were one of the lone bright spots from the Seattle defense. As much as a great story that Shaquem Griffin is, the rookie linebacker struggled mightily as a starter for the Seahawks today. He let in the first touchdown to Phillip Lindsay on a busted coverage. His replacement, Austin Calitro, was just as poor. It’s extremely hard to replace an All-Pro talent like KJ Wright, but Seattle right now has a massive hole at his spot. It’s unlikely anybody saw Will Dissly playing like that. His time as a Huskie never showed it, but he moved well and did some surprisingly good work after the catch that could translate to a sustained role. The knock on Seattle for so long has been their line, and they certainly weren’t great in Denver. But this was a game which highlighted how tough it is for them, as Russell Wilson was prone to both holding onto the ball and vacating a clean pocket to cost his lineman leverage. Of course, those tendencies are part of his brilliance, buying time and room to make big plays, but it can really hurt the impression of the big guys up front. Without particularly good quarterback play, the Broncos relied on their big men at the line of scrimmage to win the game. 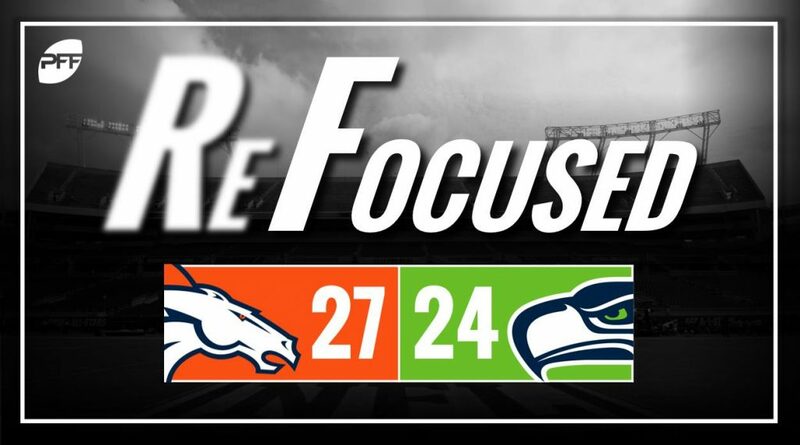 Both the Broncos’ offensive and defensive lines controlled the game and were the biggest factors in the Broncos coming away with the win. Sacks kill drives, and the Seahawks were guilty of taking more sacks than the Broncos earned. This isn’t just a fault of the offensive line but the whole protection unit.